Save the Music's Recent Releases section is best place to find new Jewish music online! If you would like to add a release to our listings, please click here. If you are a performer and would like to be included in our listings, please click here. Betty Klein, international folksinger, pianist, guitarist, harpist and accordionist has performed in the U.S., Europe, and Israel. She appeared on the BBC, Belgian, Israeli, Spanish and Italian radio and television. She performs at the Disapora Museum and conducts Yiddish sing alongs through Israel. Yiddish Soul, a feast of music both ancient and radically new, closed the 2002 "Food for the Soul" Festival on October 13, 2002. A stellar group of musicians -universally acclaimed for their varied groundbreaking projects in traditional and contemporary Yiddish music and theater -celebrated the vitality of Yiddish culture at the beginning of the 21st. century. Fed by the humility, humor and creative passion of generations of artists, these celebrated Yiddish songmasters moved through centuries of musical territory that brought the 700 lucky people in attendance to their feet. The book Melodies of Yiddish Shtetlakh contains examples of Yiddish music (folk music and compositions) and continues the series devoted to the Jewish musical heritage. Although interest in Yiddish music has increased considerably in recent years, its study has become more and more complicated, because the world in which Yiddish culture emerged and flourished doesn't exist anymore. The main purpose of this book is to reintroduce forgotten and unknown scores and historic information relating to the Yiddish musical heritage. There are some differences in the spelling of Yiddish words in this book. Yiddish uses Hebrew script, but in the post-revolution period Latin script started to be used specifically for song lyrics. However, geographical differences in Yiddish dialects represent real differences of pronunciation, while in some cases perhaps differences are due merely to an absence of rules for transliterating. The spelling in this materials is as it appears in the original materials. This collection compiled and edited by Dr. Yelena Irzabekova and titled Jewish Songs and Dances contains Yiddish musical folklore arranged by Soviet Jewish composers. The majority of songs and dances included into this work were collected, arranged and published for the first time in the pre-WWII period in the former Soviet Union. New Yiddish songs by a leading Yiddish poet and songwriter, Beyle Schaechter-Gottesman, and performed by today's best young klezmer artists and singers including: Michael Alpert, Adrienne Cooper, Frank London, Lorin Sklamberg, Theresa Tova, Sharon Bernstein, Benyumin Schaechter, Pete Rushefsky, Deborah Strauss. 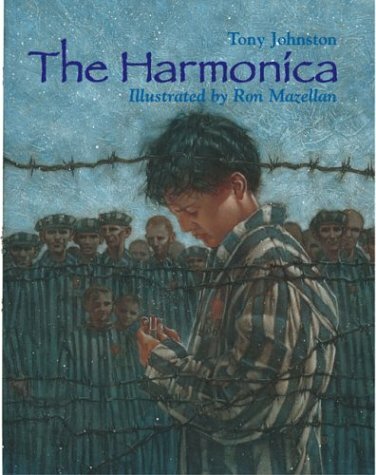 Based on a true survivor story, this powerful picture book is yet another astonishing Holocaust account for discussion. A Polish Jewish child, blissfully happy with his loving parents, gets a harmonica from his coal-miner father and learns to play Schubert while his parents dance. The realistic mixed-media, double-page illustrations contrast that glowing warmth of home with the darkness that comes when Nazi soldiers break down the door, separate the boy from his family, and send him to the camps. His harmonica becomes his solace. The commandant hears about the child's playing. He orders the boy to play Schubert and throws him bread. In the end, however, the music does nothing to humanize the brutal Nazis. In fact, one unforgettable picture shows the commandant blissfully listening to the music, one hand over his heart and the other holding a whip. The home memories are idyllic, but there's absolutely no sentimentality about the child's survival. Johnston gives children and grown-ups lots to talk about here--for example, Can a person be both sensitive and cruel? In 1983, the Austrian State Broadcasting Service produced a two-hour program on Gebirtig, as part of a series on great Jewish personalities, such as Freud, Einstein, Marx, Mahler, Buber, etc. Had anyone suggested to Gebirtig during his lifetime that a time would come that he, the humblest of the humble, would be considered one of the greatest in his field of folk-music, he would have considered it a joke in poor taste. In this way Sinai Leichter typifies Mordekhay Gebirtig in his "Anthology of Yiddish folksong", Volume 6, and it is a striking characterization. A "Frylech" full of the sweetest kletzmer this side of Delancey Street. A delicious taste of music, laughter and songs filled with outrageous humor in English and Yiddish, are the main ingerdients in this CD. Composer and violinist Yale Strom has attempted to capture the many faces of klezmer on this album, and in part he succeeds. Whether it's on "Biribidzhan," with its familiar frantic pace (there were many similarities between klewzmer and Gypsy music), or "Horo Din Caval," led by some lovely guitar picking, or even the attempt at soul with "Ten Plagues," he refuses to be shackled to some stereotype of klezmer. And that's all well and good. The best Yiddish recording for children in the last years. A must have CD for every family. Leibele Jinich, Chazan Emeritus of the Mexico's Bet-El Community honors in this CD to the Chazanim, Singers, Musicians, Composers, Directors and Poets who have made a contribution to enrich the Jewish music around the world. This CD is also in honor of the following Jewish towns and cities in Europe: Merech, Lapi, Odesa, Radsky, Lazdei, Sanock, Zagush, Vilna, Warsaw, Dobrzyn, Satoraijavjhely, Salonika, Suvalk, Punsk, Uman, Ostrovietz, Starobin, etc. Listen to 10 Yiddish writers reading from their own writings in this production by Sheva Zucker which brings the Yiddish voice to those who did not have a formal yiddish education and never heard the writers, teachers or performers read high level writing in Yiddish. Enjoy Sholem Aleichem, (yes the original in his own voice! ), listen to Leivick, Molodowsky, Glatshteyn, Leyeles, Sutzkever, Mash, Shraibman and of course Schaechter-Gottesman reading their own writings. Enjoy the recording, enjoy the language and get to know the writers in the included book of biographies (All in Yiddish AND English) and if that would not be enough read with the readers with the full transcript provided in a second booklet with all copy in perfect Yiddish with a brief but good translation into English and a lexicon for specific words translated into English, Russian and Hebrew. 1114 Iredell St. Durham, NC 27705. The cost is $25 + 2 for postage in the US. Postage for other countries may vary. Jacqui Sussholz sings with such feeling, he can make your spine tingle. You`ll hear his heart and you`ll feel he knows your soul. He can be tender, joyous, or deeply moving. He can make the hair stand up on the back of your neck. Sussholz is the real thing: his traditional Yiddish and Hassidic music comes direct from the source, and you can hear it. The brilliant, richly-textured musical arrangements bring vibrant new life to Yiddish/Hassidic classics. This is music that transcends categories; music lovers everywhere will hear its call - and respond. Yiddish really is for ever - and for everyone. Yiddish is Forever: the full 3-CD collection - 48 songs, more than 3 hours of great music. This charming Haggadah emphasizes Yiddish culture through wonderfully relevant selections from Sholom Aleichem, I. L. Peretz, Chaim Zhitlovsky, and Yiddish songs of rejoicing and resistance...Our uniqueness as a people is both observed and celebrated. One of my favorites. Mayn Oytser...is indeed a treasure...Mellow, melodic, fresh, this collection brings new life to old and new classics...We should all celebrate the release of this CD. Some of the songs are old vintage, others are more recent, but Sherm Labovitz sings all of them with a magnetic haunting nostalgia that makes one listen to them over and over again. For over 20 years Alex Spektor and Vitaly Barishnikov have been performing, composing, and producing award winning original music, and song writing for the television and film industry. Now they present "Vu Is Du Gesele", a collection of Yiddish folk songs with a modern interpretation and sound, dedicated to the People who perished in the Holocaust. Even when they seemed to have taken their own routes, the truth is that both the African-American and the Jewish experience in America are as close as ever and will keep on developing side by side since anything that happens to one will affect the second one. On a positive note In this record both musical experiences come together to create a unique mix and a new sound for these communities. "Sha Shtil" brings together the rhythms of Eastern Europe with the ones from Western Africa to create a rich melody worth of the best American tradition. Famous Russian Night Club artist. Sings 11 New Songs in Yiddish, Hebrew and Russian. If you want to give a gift or simply want to make sure you have a complete collection of Yiddish music you must have this CD. A hand picked collection of most requested Yiddish hits very nicely orchestrated and sung by Mike. Enjoy Mike Burstyn in your living room. With this CD you will enjoy his showmanship and humor while listening to songs in Yiddish., English, Hebrew and "Brustynian" a language invented by the Burstyns mixing all the different components of their world from Argentina to Canada, from France to Israel. A really enjoyable album with one of the most renowned Jewish showmen. A Jewish Odyssey, a compilation that explores the richness and diversity of Jewish music. From the Mediterranean flavors of Sephardic music to energetic and emotive klezmer, A Jewish Odyssey follows the long journey of Jewish music from the Middle East to Eastern Europe, Spain, Turkey, Italy, the USA, Israel and beyond. You might not recognize the country this CD comes from and you might never have heard about it but once you listen to this CD you will know Yiddish soul is well and alive through out the centuries and the geography. Believe it or not...we received this recording by Masha Yacubovich from Uzbekistan. 17 songs written between 1850 and 1928. Yiddish Songs - From My Heritage is the title of this CD we just received from Mexico. The Center of Jewish Education in Ukraine sent us this recording, containing the traditional dance "Mitzve Tanz"
A half Sephard and half Ashkenaz (Ashkephardic) singing Yiddish work songs. He also has recordings in Ladino. From Israel...The Songs of The Murdered Jewish People. A Requiem after the poem by Itzhak Katzenelson. A self proclaimed fourth generation Klezmer from San. Diego. Honey Would You be Meshuga Tonite? This CD contains a rich mixture of jazz, Dixieland, klezmer and Yiddish secular music. The list of songs include a wonderful combination of all kinds of music from the "Anti-Fascist March" and "Meshugas", to "The Nice Jewish Wedding in New Orleans" and "Babes in White Satin"! The performance is first class and although not all songs would easily qualify as Jewish but certainly not as Klezmer music it is a record worth having where everybody will find something they like. Trio Sefarad's interpretations are based on existing musicological studies, enriched through their own research and by their connection with the members of Sephardic communities in different countries. The music included in this CD proves it true. It also includes a booklet written in English, Spanish and French with information about Sephardic Music, History and more. Enjoy it! From Turkey, we received this new recording of Lina Kohen's 100 year old poems, "87 Anios Lo Ke Tengo"
From Paraguay, Montserrat sent us her latest CD recorded in Israel. From this recording, we have included in our collection "Kuando el Rei Nimrod". Here we show a sample of "Adio Kerida", a "kantiga" from Bulgaria. A release by the accomplished guitarist Gerard Edery, a Moroccan Jew with solid classical training and a smooth, warm voice, soprano Cassandra Hoffman and tasteful percussionist Rex Benincasa. Very appealing arrangements. The Gerard Edery Ensemble explores the rich complex of varied musical traditions bequeathed to us by a cosmopolitan Renaissance civilization that reached its peak in The Golden Age of Spain. Commanding songs in some dozen languages, including English, French, Spanish, Ladino, Hebrew and Arabic, these gifted musicians engage the antique repertoire as a living legacy, combining stylistic authority with an immense creative flair. In collaboration with The Village Temple in New York City, The Gerard Edery Ensemble’s latest release is an offering of spiritual songs from Morocco, Persia, Turkey, Yugoslavia, Spain and Portugal as well as original songs composed by Gerard Edery and based on sacred texts. Sung in English, Hebrew, Ladino and Arabic. Includes Adon Olam, Eli Eliyahu, Ya Ribon, L’Cha Dodi, Los Bilbilicos, To Everything There is a Season, Mi Ze Yemalel and many more with full lyrics and translations. The name of this CD, Sing to the Eternal, conveys the hope that it will be a pathway for all who wish to enter into a musical dialogue with our Creator, our People and with all of humanity. The original songs, arrangements and translations reflect our belief that we cannot create the definitive liturgical format and sound for our time, but need to be ever open to the musical traditions around us. From the oldest Sephardic traditions to the newest efforts to rescue its folklore comes this record which combines traditional melodies from all over the Sephardic world. Real non-professional people recorded these melodies which will illuminate your tour through time and space around the Sephardic world of yesterday, today and tomorrow for your amazement and enjoyment. Discover real folklore with this unique recording coordinated by Moshe Shaul, possibly one of the most knowledgeable and most enthusiastic supporters of Sephardic Culture. El Kante de Una Vida reflects, as its name imply, the songs of a lifetime. Actually, it reflects more the songs of a people since it encompasses a large selection of Ladino folk songs and a second CD of liturgical and nursery rhymes translated into Hebrew. A CD you will surely enjoy. The booklet includes the copy for the first CD's 29 Ladino songs -in Ladino- and the text, in Hebrew only, for the second CD translations. En este CD topamos tredje Kantigas escritas por la escritora i "reyna de los kuentos", Matilda Koén Sarano, i una otra traducida por eya del ebreo al ladino y eskrita por Danya Haim. El sujeto sentral de estas kantigas es el amor: amor por el kriador y amor por la persona, ke no konose frenos ni limitos, kon la alegría y la tristeza que están atadas endjuntos. El kompozitor de las melodías de las kantigas es Avraham Reuveni, ke no aze parte de los djudíos sefaradís, mas sus kalidades y sus talentos le dieron la inspirasión a kompozar de estas "perlas de Espanya", múzika en estil latino moderno ke se adapta a la fuente de la kuala toma Matilda Koén-Sarano los sujetos de sus kreasiones. Yahudice is the name used for the Ladino (Judeo-Spanish) language of the Jewish population in the Ottoman times. This album presents Ladini repertoire from a different perspective. It deals with urban music from Istambul, Izmir, Thessalonika and Jerusalem. A 168 pages booklet complements this amazing recording. Sephardic music in Judeo Spanish and Ladino. Jak Esim is one of the most important people in the world with his researches and collection of songs in this field. They make a contemporary, polyponic interpretation true to its authenticity with their group consisting of prominent musicians of Turkey. The group aims to introduce the Sephardic music to the international arts platform in the most efficient way and starting with this ethnic structure they also aim to form different vibrations. Dos autores se adjuntaron para ofresernos el fruto de su kreasión en un kampo orijinal i ezmoviente: kantigas con palavras i muzika djudeo-espanyolas. Los sujetos de estas kantigas son muy variados: ay kantigas de amor, de despartisión y de selo, ay un kante de kuna, ay kantigas de famiya, de amor a Yerushaláyim. Este es un tentativo inovador ke merese muestras felisitasiones. The songs in this cassette include some romanzas (ballads) that are sung only in Jerusalem in their own dialect. Yizhak Levy, Moshe Attias, and currently Matilda Koén-Serrano and others have preserved this songs. The lyrics can be found in the book "Vini Kantaremos", by Matilda Koén-Serrano. The disk cost is $12 Dollars each plus postage. Also from Philadelphia we received this very unique CD of non-western Hebrew spiritual music in the rhythmic traditions of the Middle East. Not for everybody since a special sensibility is required to fully enjoy this performance but, for those who get it, it is a beautiful piece of art. We just received this CD from San Diego California, including the most important songs for Shabbat. A mix of Yiddish Hebrew and Sephardic songs. The Sheba Choir, is a group formed by Ethiopian children in Israel, whose travels have extended thorugh out the world. We have selected for your enjoyment "Israeli Song", a beatiful melody performed in Hebrew. From Irak we received this wonderful CD, containing Songs of Praise, Shbaboth and Pizmoneem, in the Babylonian Jewis Tradition, as sung in Babylon and several Sephardi Communities. Shirona combines two rare gifts in this magnificent debut album - a breathtakingly beautiful voice and a talent for composing melodies that capture the soul of the listener. This CD features 14 songs of the Bene Israel musical tradition that have been recorded in Bombay (now Mumbai), India, in 1996. The songs are performed by male singers mostly in Hebrew, and a few in Aramaic and Marathi - the regional language of Maharashtra. After the June 1941 pogroms in Baghdad which left hundred of Iraqi Jews dead and created the atmosphere for the closure, 10 years later, of could possibly be called the oldest Jewish community in the world few new recordings of their millennial tradition have been made. Now with Treasures, Songs of Praise in the Iraqi Jewish tradition the group, Rivers of Babylon directed by Sara Manasseh brings as a selection of 13 happy melodies to enjoy and to use as our own key to learn and share the joy and traditions of this very old Sephardic community. Multi-instrumentalist REBBESOUL brings a new voice to the sometimes stagnant realm of Jewish Music with this new CD. His rock and world fusin stylings have a slinky Middle Eastern-sounding groove, and traditional Hebrew melodies are his inspiration. This album has been dedicated to peace in Middle East and the rest of the world. Many of these intense and beautiful works are well known to classical music lovers. Richard Locker is well known for his expressive and stylish performance of solo and chamber music masterworks.